Continuum, Windows Hello, and Microsoft's own apps are why you should consider this increasingly niche Windows Phone OS. Microsoft’s Windows 10 Mobile operating system may be a second-tier OS, but it’s not second-rate. With its new smartphone OS, Microsoft has doubled down on the productivity message, crafting a utilitarian OS with occasional flashes of magic—most notably its new PC-like Continuum feature. 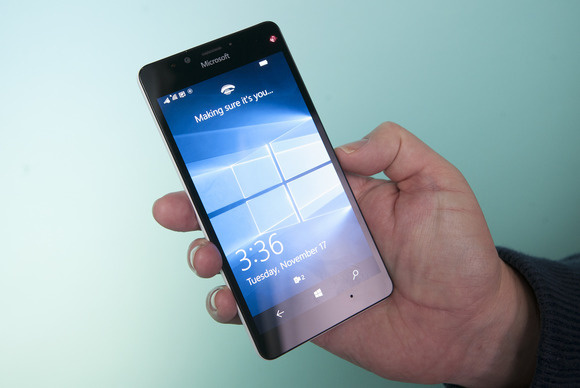 Microsoft provided us one of its new flagship phones, the Lumia 950, to test out its new Windows 10 for phones. It's running Windows 10 Mobile Build 10586, the same version Microsoft shipped to its Insider fast ring on Wednesday. Microsoft should make that same version available soon, for free, to owners of selected older Windows Phones. Note, however, that several of the most unique features of Windows 10 depend on the hardware built into the Lumia 950 and Lumia 950XL. Microsoft also assumes that if you’re buying a Windows 10 Mobile phone, you already own a Windows 10 PC. It’s not essential, but Windows 10 ties together phones, PCs, and tablets far more seamlessly than, say, the Apple MacBook and iOS. Own a PC and a Windows phone, Microsoft seems to say, and you’ll be far more productive than if you owned any other platform. The DVR allowed viewers to watch “live TV” on their own time. Google Maps sounded the death knell of the consumer GPS industry. 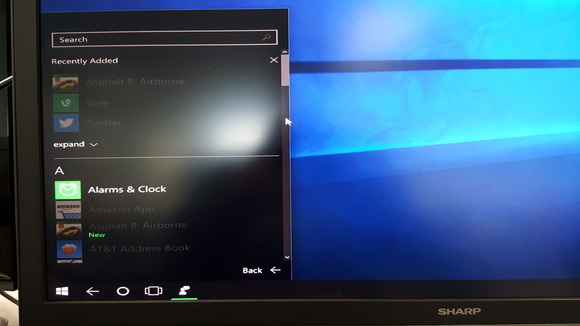 By far the biggest selling point of Windows 10 Mobile is Continuum, a feature that lets you connect your phone to an external monitor and operate it like a PC. Continuum certainly won’t kill PCs or tablets, but it’s still a profound shift in computing culture. Just keep in mind that it won’t work with all of the apps installed on your phone. Windows 10 Continuum and the Microsoft Display Dock provide a PC-like experience. 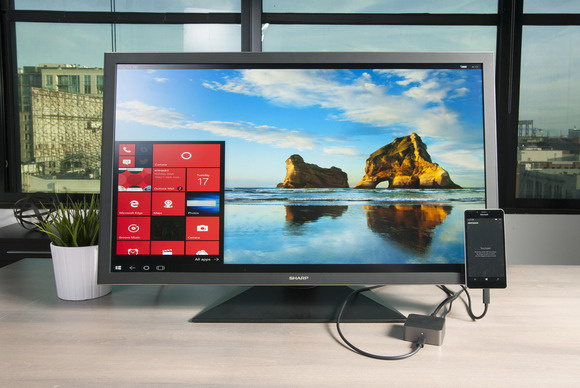 Continuum can also forgo the Display Dock entirely, projecting your phone’s screen wirelessly via Miracast to a dongle or directly to displays like the Panasonic CX800 60-inch 4K monitor in our lab. 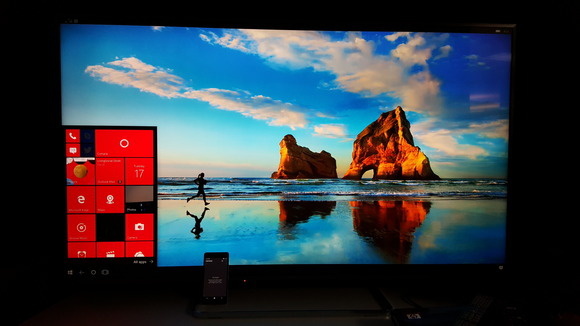 The Continuum app senses nearby wireless displays and helps you set them up. It’s amazing to look at, but not really practical yet—I experienced horrible lag and connectivity problems. With Continuum running, your phone projects a PC-like, slightly low-res desktop view onto your display, roughly similar to the look and feel of a Surface Pro 4 in tablet mode. Microsoft goes to a great deal of effort to make your Continuum experience feel like using a full-fledged computer. You can set a custom, landscape background for your monitor, and apps align themselves in a PC-like taskbar at the bottom of the screen. Tapping the Windows key brings up the Start menu. In Continuum mode, the 950’s display transforms itself into a touchpad. You can slide your fingers around to move the cursor, tap with your finger to open apps, pan and scroll with two fingers, and right-click by tapping those two fingers. You can also access the phone’s keyboard to enter text—as well as the mic, which I found to be pretty handy for dictating text. The touchpad is simply an app, however, so you can slide over to another task if needed. Continuum does have its quirks, however. On my system, I couldn’t rename a Word file as I was using it. Word also crashed once, then returned a black screen after I relaunched it. (A subsequent relaunch worked as expected, and the universal apps’ practice of constantly saving, er, saved me.) Things looked a bit stretched-out on a widescreen monitor. And to minimize or close an app, you need to slide your cursor to the top-right corner—there are no visual cues telling you otherwise. When using Continuum, expect to see some apps grayed out. I was very pleased at how I could sit down, open a Word file, begin taking notes on my experience, then return to my desktop PC and pick up where I left off, because everything is saved in the cloud. There’s one major limitation: Continuum works only with universal apps for now, such as Outlook/Mail, Messaging, Word, Excel, and Calendar. According to Microsoft, this was for functionality—the company didn’t want a lot of oddly formatted apps clogging the Continuum screen—but hopefully the app list will continue to expand. 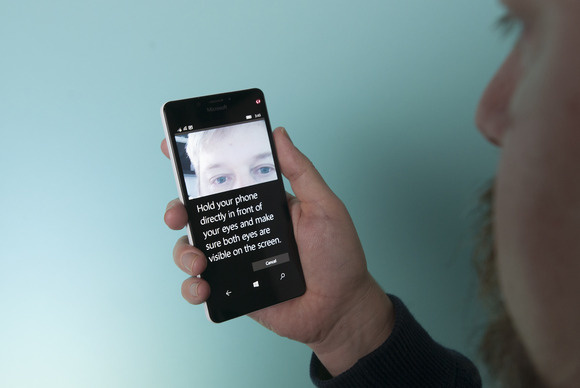 Windows Hello eliminates the need to constantly retype a PIN code by allowing the phone to visually recognize you. It’s Microsoft’s answer to the fingerprint readers built into the latest Nexus 6P or Apple iPhone. In general, though, I found performance to be a mixed bag. When Hello works, that’s all it takes to unlock the phone. But if you’re not holding the phone just so, or the light is a bit off, or you’re too close or too far away, then simply tapping your phone’s four-digit PIN is sometimes the only thing that works. I gave Hello a second or two to work its magic, and if it didn't take, I just entered my PIN. Everyone knows about the “app gap”—the sparse supply for Windows Phones compared to the plethora that Android and iOS enjoy. For better or for worse, Microsoft is making the most of what it has by doubling down on the basic productivity message inside its own universal apps. It’s here that owners of older Windows phones will see the advantages of Windows 10 Mobile, regardless of their hardware. From a UI perspective, Windows 10 uses the same Live Tile interface as Windows Phone 8.1, but with a more muted style that emphasizes wallpapers rather than brightly colored tiles. Menus and options are much more organized, with a nice array of quick-action shortcuts that can be slid down from the top. Dedicated hardware buttons have been replaced with soft icons that slide in from the bottom. Because they’re universal, Windows 10 Mobile apps—Outlook (formerly Mail), Calendar, Maps, Messages, the Store, and more—are designed with the same features as their counterparts on a Windows 10 desktop. Certain apps, however, become more significant on a Windows 10 Mobile phone. The Windows 10 Mobile Maps app. 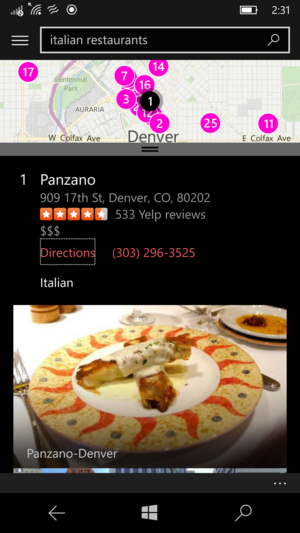 A good example is Maps, an afterthought on the PC but a critical part of Windows 10 Mobile. Maps delivers the essentials: a basic map view with traffic options, a lovely satellite view (without the need to launch a separate app), and local search that integrates with Yelp, including reviews, pictures, and hours of operation. Other key mobile apps include Camera, whose manual controls have now been supplemented with Microsoft’s lovely Rich Capture feature, allowing you to dial HDR effects up and down with a slider. Skype messaging has been drawn into the Messaging app, though Skype remains as a standalone app, as does Skype video. Who could forget about the Office apps–Excel, Word, PowerPoint, and OneNote–which tie into the cloud and into Cortana (“take a note”) as well. Edge is now built-in as the default browser, with Reading List entries roaming among platforms. And, of course, there’s Cortana, who's grown progressively smarter. Third-party universal apps include Audible, Box, Candy Crush Saga, CBS, Facebook (forthcoming), FitBit, NASCAR, Shazam, and Twitter, to name just a few. But in general, Microsoft is still shouldering the load. Recent figures put Windows Phone’s market share at under 2 percent. 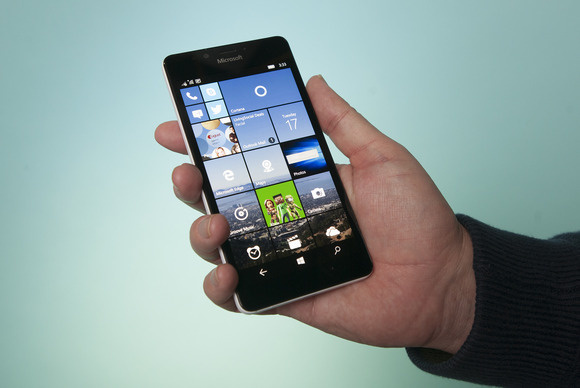 It’s not clear whether Windows 10 Mobile will do anything to change that. Developers still prioritize Android and iOS first, with Windows as an afterthought. It’s important to note, however, that Microsoft’s plan to encourage developers to port iOS and Android apps to Windows hasn’t yet come to fruition. Microsoft’s Android-to-Windows developer effort, Project Astoria, has reportedly failed; however, the program to port iOS apps, Islandwood, is still flourishing. Both roads lead to the same destination. If Microsoft can succeed in convincing app developers to port their apps to Windows, that will add immediate credibility to the mobile platform for both consumer and developer alike. But it all needs to happen soon. 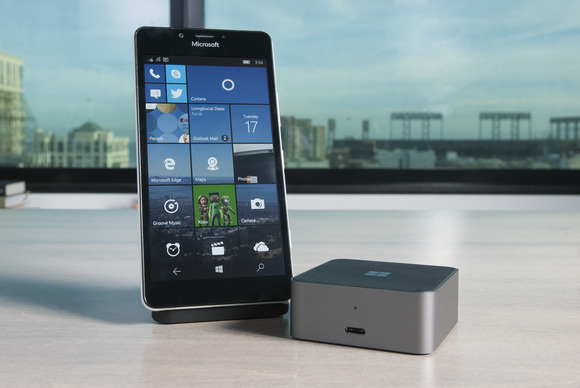 That’s the key to Windows 10 Mobile’s future viability. We wrote last year that Microsoft needed to unearth what made a Windows Phone unique, and capitalize on it with a flagship phone. It’s done so, putting itself out there as the phone for business users everywhere. My verdict for Windows 10 Mobile and the Lumia 950 is a passing grade. But the fate of Windows phones, I think, is out of Microsoft’s control. The company has done so much to entice consumers to Windows phones: previews, incorporating consumer feedback, free upgrades, universal apps, Continuum, you name it—and yet its market share continues to decline. I’d say in a year or two, we’ll know: Windows will either continue as its own smartphone platform, or be reduced to a collection of services on Android and iOS phones.